Store check: Bugatti or not Bugatti? We checked a store in the middle of Germany and stumbled across some big logos of german functional fashion favourite bugatti (not to be mistaken for the luxury car brand founded by Ettore Bugatti). 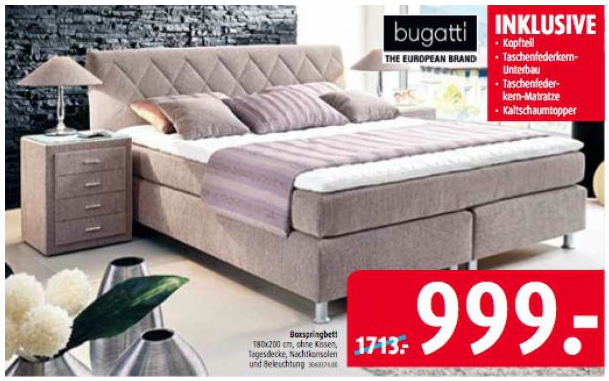 To our surprise the furniture dealer displayed fairly standard box spring beds together with huge bugatti brand logos including the fashion slogan “the European brand”. Which should signal to us and to the occasional shopper: these are genuine bugatti beds. To clarify the situation, we contacted both the dealer and the brand bugatti. Bugatti fashion insists that they have only licensed their brand for bed linens, towels and mattresses & duvets. But: not for beds. The beds shown above only sport the brand’s mattresses, but the beds are not bugatti beds. On the other hand the dealer insists that these are genuine bugatti beds produced by Oschmann and states that the beds have nothing in common with neither the fashion brand nor the classic car brand. We will try to investigate further and find out what this is: a boring but cleverly faked licence product or a new method to exploit the bugatti brand rights? What seems to be a Bugatti bed (web & in-store communication) is a no-name bed with a Bugatti licensed mattress. This is what Bugatti told us. In the mean time an ad like this – with the bugatti logo – and various online ads appeared nevertheless. We are still puzzled and maybe the upcoming fair in cologne will reap some new insights. 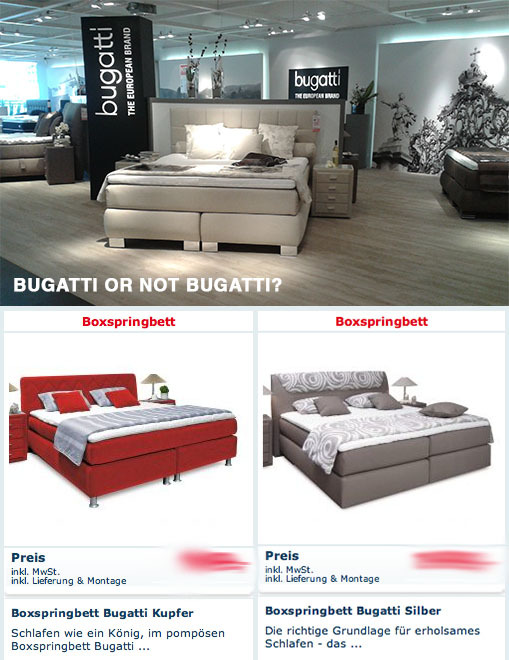 This entry was posted on August 19, 2013 by Chef de Cuisine in Home Collections, store check, Uncategorized and tagged boxspring, brand rights, Bugatti.